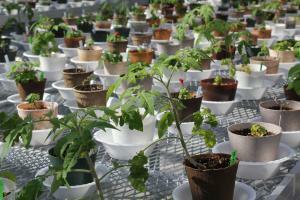 These tomato and salvia plants are growing in bio-renewable pots in a greenhouse at Iowa State University, which received a grant through the Farm Bill to study replacements for petroleum-based plastic pots. For many Americans, the contents of the Farm Bill remain somewhat mysterious. Subsidies for farmers and food stamps — now the Supplemental Nutrition Assistance Program — are two things that get talked about publicly. But there’s a whole lot more to the massive bill. The Senate-passed version would cost about a trillion dollars over the next decade. So even smaller programs can be big money—like a $25 million biofuel research project headed up at Iowa State University, with several other partners. “Our long-term emphasis really is trying to have a positive impact on agriculture, trying to have a positive impact on the environment and trying to create an opportunity for society to move forward with an alternative and renewable fuel system,” said Ken Moore, an agronomy professor at Iowa State and leader of the CenUSA Bioenergy project. He said the idea behind CenUSA is to grow grasses on marginal land, which is not good for crops anyway, and then create bio-fuel from the grass. If successful, this process could be carbon negative, he said, meaning it would produce fuel from plants in a way that actually reduces greenhouse gases. Moore’s money is secure. It was all included in the now-expired 2008 Farm Bill. But others who may have hoped for a future Farm Bill grant could be left waiting…indefinitely. Until a new Farm Bill becomes law, many programs can’t enroll new participants or solicit new grant proposals. Those programs include the Specialty Crop Research Initiative, which funds another—much smaller—Iowa State project. Researcher Kenny McCabe works with a team that’s trying to identify the best bio-renewable alternatives to pots made from petroleum-based plastics. You know the pots — they’re the ones vegetable starts and yard plants come in. The alternative pots use other types of plastics plus organic matter for filler, like corn stover, soy fiber and the distillers grain leftover from ethanol production. And there’s another tiny slice of the Farm Bill pie that feeds a very eager demographic: beginning farmers and ranchers. “The deck is stacked against them from before they even get their boots on in the morning,” said Luke Gran, who runs the Next Generation project at Practical Farmers of Iowa, which received just over a half-million dollars of Farm Bill money to develop programs for the least-experienced farmers. Floyd County, Iowa. He and his wife also still have full-time jobs off the farm. But Jung said Practical Farmers is helping them get their business going, so maybe someday they can leave their day jobs. The future for some Farm Bill programs may not be much more secure than Jung’s dream. During the lame duck session, the House could pass a bill that then gets reconciled with the Senate version. Or, Congress could approve a short-term extension, delaying a five-year package and further complicating planning — both on the farm and off.